I went up to the farm early in the morning to see if I could get a peek at the lambs. 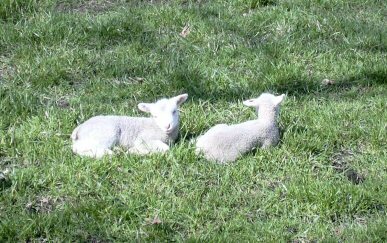 That wasn't hard-there were about 20 in the first pasture, a big maternity ward and lamb nursery. If you stood there long enough, one might be born right before you. I wish I had a soundtrack of all the bleating, baaing, snoring, noisy nursing. I don't think they are entirely sure about who belongs to whom. A lot of searching, calling, nudging. Are you my mom? Some don't really care... just a patch of sun and grass are already enough. Or a warm place in the center of the flock. Bound to be an available mommy somewhere in there. Others are paying attention though. Hello, can I help you? And then I saw this...how long did I look and not see? Finally heard the growling rumble among the baaing. Clearly, I wasn't enough to worry over. Not considering jumping over that fence. Oh cute, is that your dog? 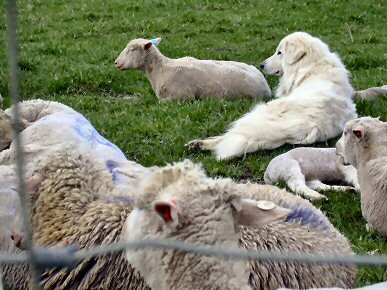 those lambs are pure sweetness.. and of course so is the dog! How I wish you had a soundtrack for these pictures. That would be music to my ears! Love all those spring babies, milling about in the fields. The 'Are you my Mom?' reference reminded me of the childrens book "Are you my Mother?". Awww happy memories of that one. 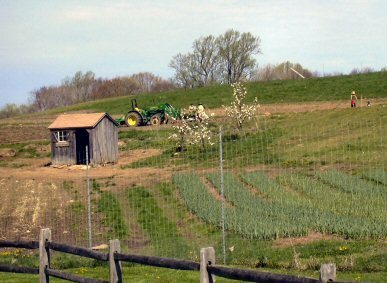 How wonderful that you have such farm close by to visit! It's not yours right? Or am I missing something...? Anyway, the photos--beautiful, so precious. And the dog! So mindful, guarding, and knowing what to worry about and what NOT to worry about (you). Love the sheep who actually paid attention to you. Wish it were mine but just can't compete with the Rockefellers yet. Nice that it's open to the public for wandering, hiking, learning, farmers' marketing, eating. Check out the textlink "farm" for more info on Stone Barns. You weren't kidding! It is a very lamb-y post. 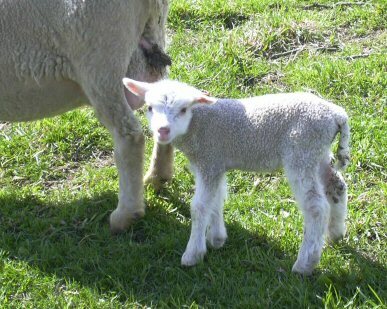 We had a lamb as a pet at my Gram's house when we were little. His name was Pamper. I especially love them when they are brand new and so clean and white! Thanks for sharing your photos. And, enjoy your "little lamb reunion". Those little lambs are so cute! They bring back fond memories of a friend I had growing up in Montana - they owned so much land, and she had a pet lamb that we used to take on camping trips in her "backyard" (which spanned half a mountain). Thanks for the trip down memory lane! Very lamb-y indeed! What a wonderful farm. You must be excited to see your daughter. (Will all those suitcases be filled with laundry?) My oldest is a junior in high school and we're doing college tours a lot these days. I get sad just thinking about her going off to school so I savor every minute with her. 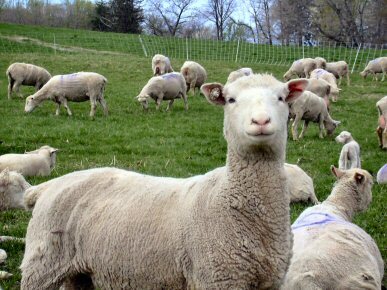 Oh, I love all those sheep and lambies. Too sweet! 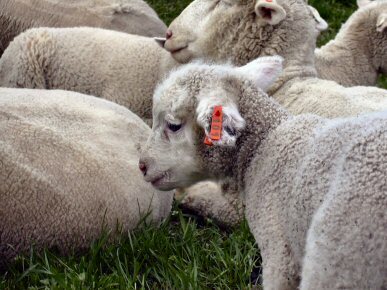 I'll get my dose of those cute creatures this weekend at the Maryland sheep and wool festival. I can hardly wait! Thanks for sharing those great pix. This is so COOL!!!!! Love it! Little lambie pies are so dang sweet....and beautiful watchdog....oh what a wonderful sight! Reminds me of watching baby calves being born on my grandpa's farm....spring...new life....aaaahhhh...wonderous isn't it? And welcome home to your lil lamb, too! Mine is also finished with her semester...however, she came back home this year....still love seeing her at the end of the day! Come visit sometime...no sweet lambies...but lots of baby flowers! o.k., you are just too adorable. i love the one that said "may I help you?" I hope you have a wonderful visit with your lamb-y.....and tons of baaaing and bleating. Several of our neighbors raise sheep here, too! 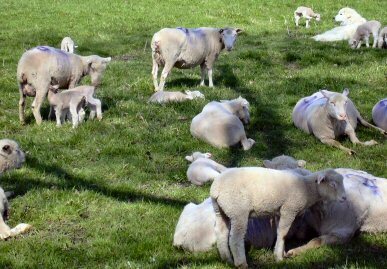 The lambing season is my favorite! Around here I guess it starts a little earlier, the end of February and into the first of March. Often in the night I'll hear a little one calling for his momma. One year the girls each had a lamb to raise! My little lamb returns home from college this weekend, too! Same noises will be happening around here. It's been quiet without her! I'll need more and "better" food as well! Enjoy the homecoming! 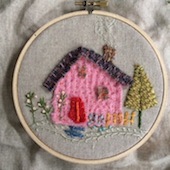 Ohhhhhhh- now that is just an adorable site! One that I've never seen! They are so cute, Charlotte! Great pics and post - enjoy your sweet lamb this summer, as I know you will! You girls are going to have so much fun! Does the dog have a name?? George lives in the pasture across the street from our church. We love to watch him get all protective until he realises its just us with a treat for him. Oh Charlotte, what a sweet post! 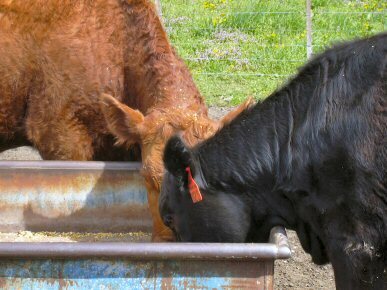 One of the things we miss most about the farm, is spring and calving! When we took the drive to Grafton, last week, we saw lots of "babies" in pastures along the way. 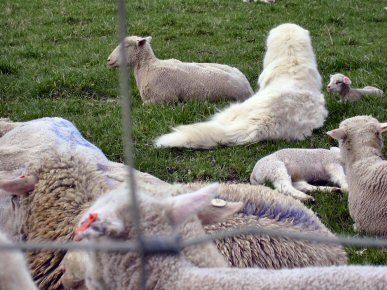 The Great Pyrenees, is an added bonus to your post. My daughter and her family have a Great Pyrenees, "Bliz". They drove through a snowstorm down south of St Louis, several miles, to pick her up. She is a sweetie. Enjoy your summer with your daughter! Lambs and the flowers in the last post. What a lovely post, enjoy your reunion with your little lamb. You've made me miss lambing season so much. We had romneys until a year ago when we moved to TN. Now I sit patiently waiting to look for property. Just look at those cuties! What sweet pictures! Oh how this post put a smile on my face. What Heaven. 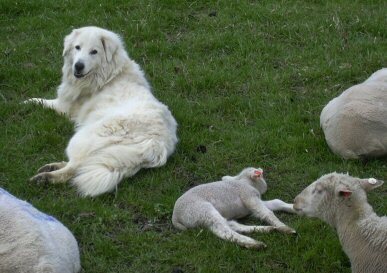 How I love sheep...and dogs...the best of both world's here today! Love that Dog! Had to look again at other pictures to notice him...We have a dog that looks very much like that, we call her Rooby-Doo, scooby doo's 1st cousin! LOL!! !